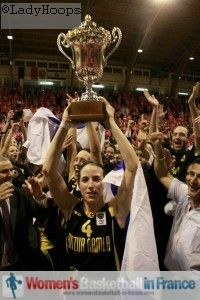 The sprained ankle of Shay Doron (left) did not stop her from lifting the EuroCup Women trophy for Elitzur Ramla. Doron who finished with 14 points and 3 assists was the player of the match. However Laine Selwyn and Le'Coe Willingham with 15 points apiece led the scoring in the (61-53) victory. This is the first time a women's club from Israel has picked up an intercontinental title. Around 2500 people were in the hall of Arras to watch this game, with 90 percent of them in pink t-shirts. The game itself was tension packed despite both teams struggling to get the ball to drop for most of the game. Arras Pays d'Artois had the better of the first quarter (13-5) but were put on the back foot during the second quarter. They went into the locker room trailing (22-33). They did not recover and ended up losing the game (53-61) and the Eurocup Women final (114-122). Tanasha Wright who had played in France during her career explained after the game that "her team played well and that both games were of a good level." She added "that Arras was good but her team was just a little better". You can read our report and watch highlights from game one here. Below you find our match report of the second leg of the EuroCup Women final and view the game highlights from FIBATV. Despite the festival of misses by both teams at the start of the game the match was played at pace. Laine Selwyn scored the first points of the game with a three-pointer from the top of the arc. After six missed shots, three minutes into the game Pauline Akonga N’Simbo finally opened the Arras account. Le'Coe Willingham and Marielle Amant both defending their territory had a little tussle that got the home fans screaming. Arras continued to defend hard and with Akonga N’Simbo scoring at will, Arras finished the first quarter with a 9-0 run to lead (13-5). Elitzur Ramla were more aggressive at the start of the second quarter. With Tanasha Wright and Willingham getting to the foul line they started to cut into the Arras lead. Arras continued to give their guests free trips to the charity stripe. Shay Doron took advantage to hit a couple of free-throws for her side to regain the advantage (19-18) with just over six minutes to play in the first half. Worse was to come for Arras with Amant picking up a technical foul and her fourth foul after another clash with Willingham. Arras - on the back foot - did not score for over four minutes while falling further behind (29-18). Finally Aija Putnina ended the barren spell for the hosts with a 3-point play. Yet this did not start a revival and Arras went into the locker room trailing (22-33). Arras stepped up after the break with first Akonga N’Simbo finding her way to the basket and then Johanne Gomis firing from beyond the arc. Krissy Badé's experience started to show as Arras continued to bring the score down while Olesia Malashenko gave Elitzur Ramla a hard time. Although Arras went into the final quarter only trailing (41-44) they were unable to get closer. Nothing was going right for Leilani Mitchell who also picked up her 4th foul at the start of the final quarter. Wright and Willingham continued to hit heart breakers for the home fans but it was a big three by Rivi Grinboym that swung the pendulum for good in favour of the guests. Grinboym's only points of the game with five minutes to play (52-45) allowed her team to control the pace of the game for the rest of the match. Still leading (56-49) with a minute to play Arras had no choice but to foul to stop the game clock. Elitzur Ramla hit 5-of-6 from the charity stripes to close the game (61-53) with Doron hitting the fist 4 and Ornit Shwartz the last 1. You can watch the EuroCup Women final match highlights from FIBATV here.